The project team were delighted to begin the development of one of our key project outputs by participating in two events hosted with the Commission for Victims and Survivors (CVS). These events are the first step in the process of creating a set of media guidelines aimed at providing guidance for victims and survivors wishing to effectively interact with the media. 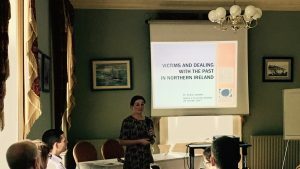 Dr Cheryl Lawther presented at the first event, which took place in Derry/Londonderry with members of the Victims and Survivors Forum. 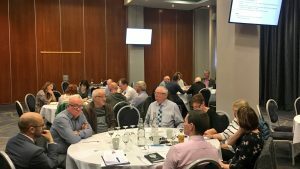 All members of the project team attended the second event, a policy seminar hosted by CVS in Belfast and attended by victims, survivors, and others involved in efforts to deal with the past. How do you think the media has represented the needs and experiences of victims and survivors of the Northern Ireland conflict? Have you ever felt uncomfortable with how victims and survivors have been portrayed through, or engaged with, the media – including radio, television and social media? Do you think there is a need for user friendly guidelines to be created outlining how best individuals and groups can engage with the media, and also looking at how best journalists and others report on conflict-related news stories? From your perspective, what are the most important areas those guidelines should cover? Feedback is being collated from both events, and will be combined with examples of international best practice to produce a draft set of guidelines. Further feedback will then be sought from victims and survivors before the guidelines are finalised. The project team greatly valued these opportunities to hear directly from victims and survivors about their views on, and experiences of, their representation in the media. The team looks forward to hosting and participating in further events as the guidelines are developed.